If you have been following Hello Lovely for any time at all, you know I am not one of those decor bloggers who redecorates every 3 months. While mine is a creative spirit, I don’t have a heart for trends or changing things around too much. What I love is timeless and tranquil all year round with little need for reinvention or refreshing beyond a few linens and accessories. My Fall Kitchen & Main Sreet Market Rockford will (1) give you a few glimpses of the flavor of fall decor I favor: pastels with pops of warmth and (2) highlight some of my favorite moments at my favorite local open air market. Pumpkins and pastels are my cup of tea. Hello Lovely Studio. My Fall Kitchen, 2018 and Main Street Market Rockford, Fall 2018. 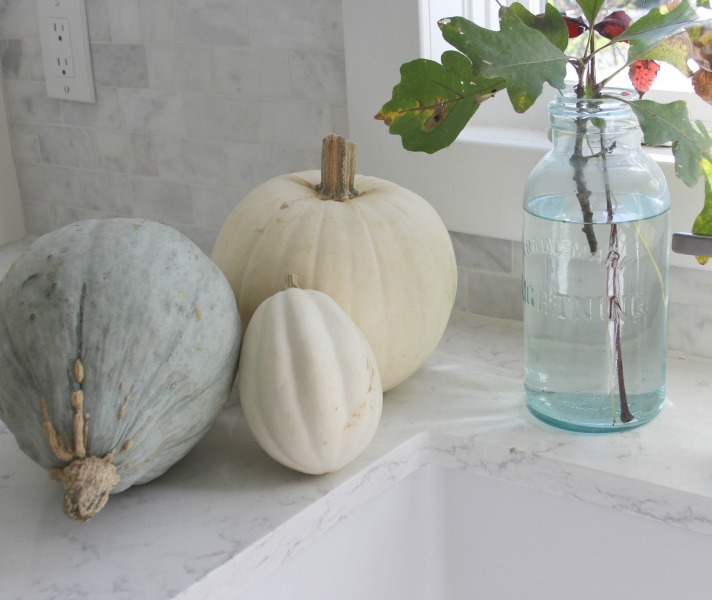 What changes happen to the kitchen in fall? Pale and lovely for fall. Hello Lovely Studio. My Fall Kitchen, 2018 and Main Street Market Rockford, Fall 2018. Simple oak branches from right outside the door come inside to hang out with a few gourds. I bake homemade old fashioned sourdough bread all year, and there’s nothing like the aroma of cinnamon bread baking in the oven when the temperatures begin to drop outside, warm apple cider sounds delectable, and the cozy sweaters come out of storage. 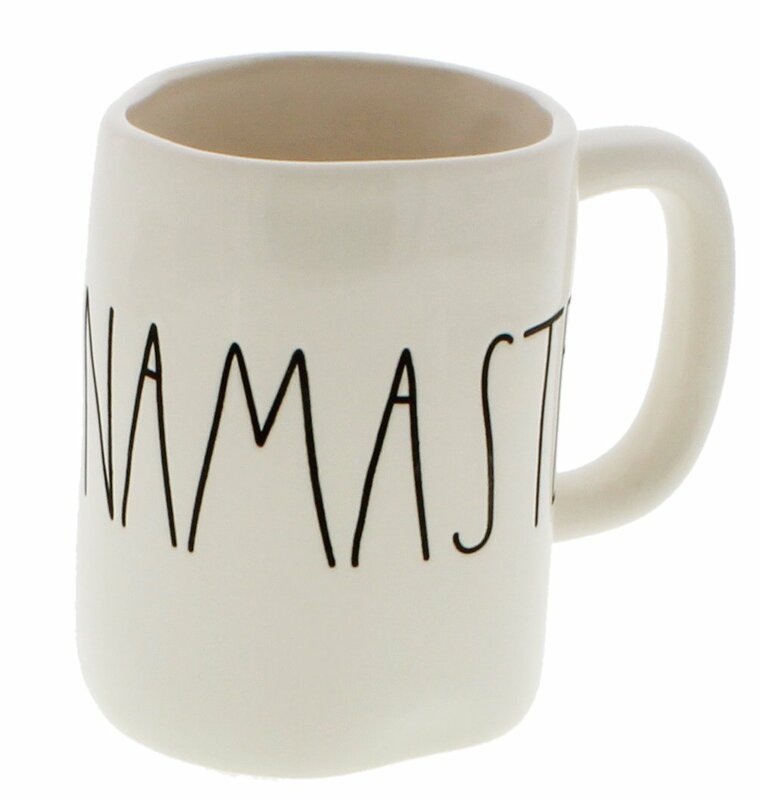 Namaste mug by Rae Dunn: FIND HERE. I began collecting pottery from Rae Dunn many years ago before her rise to fame when I followed her wonderful blog – I love its wonky imperfectness. My cinnamon bread will always remind me of my Swedish Gram (she wasn’t my blood relative – but she was Gram) who spoke no English and served us kids delectable meals! Round braided placemats: FIND HERE. Hello Lovely Studio. My Fall Kitchen, 2018 and Main Street Market Rockford, Fall 2018. I found this vintage, Ridgeway, scalloped edge plate at the thrift store the other day. 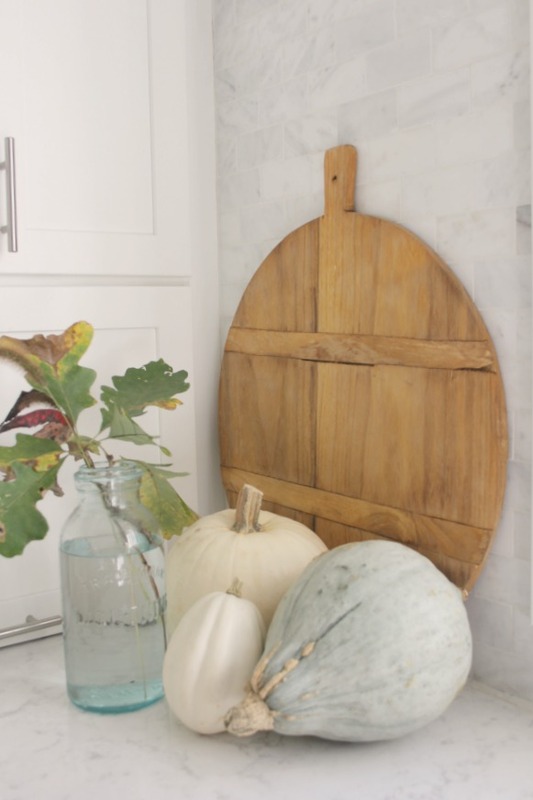 The foam pumpkin is from Dollar Tree painted with a little BENJAMIN MOORE Revere Pewter (EXACT Product HERE). I popped off the stem that came with it and replaced it with a silk rose (FIND HERE) I snipped from its stem and dipped in plaster mixed with water for a pancake batter consistency (FIND IT HERE). Total cost: less than $2. 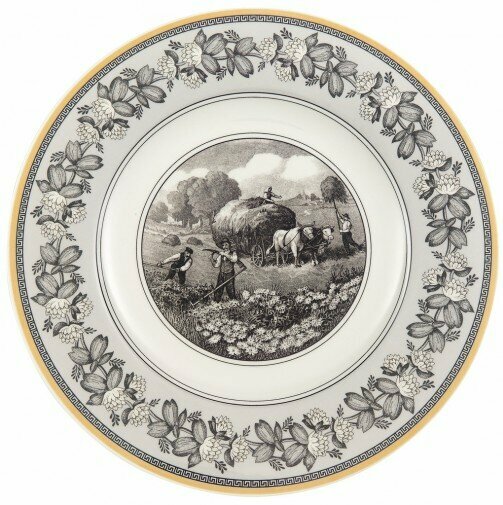 Vintage Ridgeway plate. 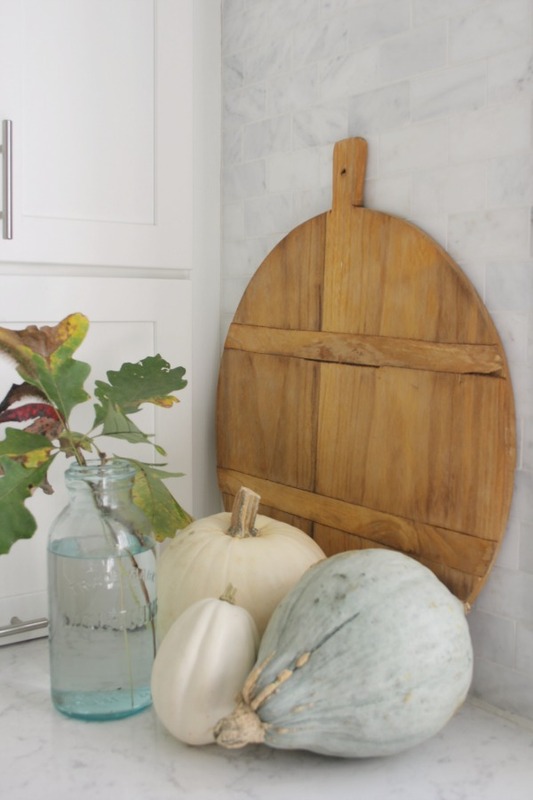 The foam pumpkin is from Dollar Tree painted with a little BENJAMIN MOORE Revere Pewter. Hello Lovely Studio. My Fall Kitchen, 2018 and Main Street Market Rockford, Fall 2018. BEFORE. The foam pumpkins from Dollar Tree. Not that foam ones can ever compete with nature. 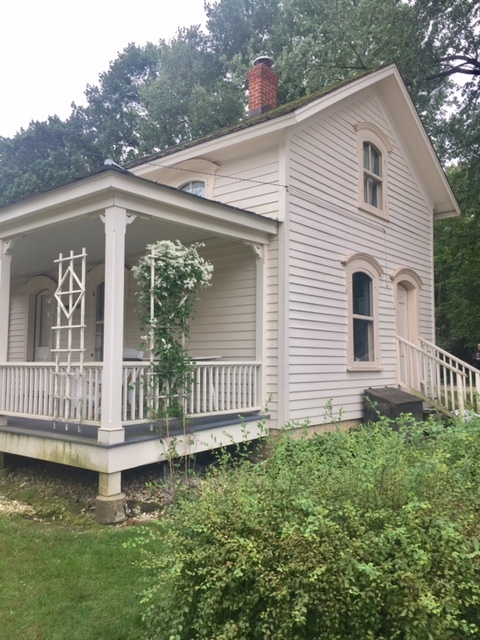 I bought the very old jar with the best aqua color at Nellie’s Barn Sale years ago when the sale was held in the organizer’s backyard which just happens to be a stone’s throw from my own home. 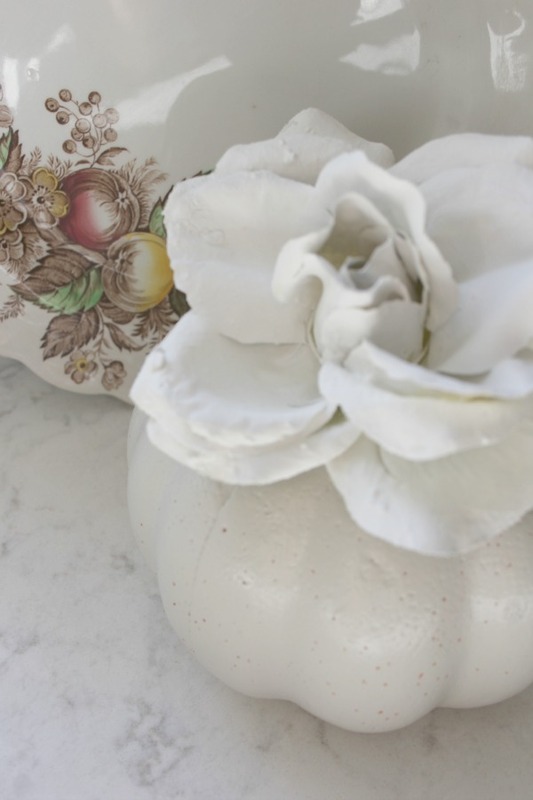 My countertop is Viatera quartz: Minuet. Hello Lovely Studio. My Fall Kitchen, 2018 and Main Street Market Rockford, Fall 2018. My little pumpkins on the kitchen’s window seat. 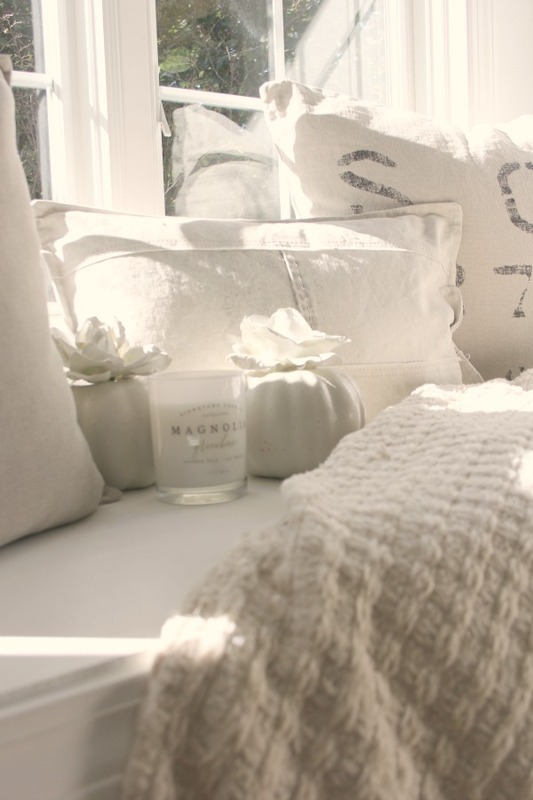 The chenille throw and almost all the pillows in here are vintage RH. Tone on tone window seat. Hello Lovely Studio. My Fall Kitchen, 2018 and Main Street Market Rockford, Fall 2018. I shared with you the story of my still relatively “new” old wabi sabi work table RIGHT HERE, and we still love it! It gets so much use, and it is one of my favorite finds for this home. The antique ironstone pedestal is made in Belgium. Hello Lovely Studio. My Fall Kitchen, 2018 and Main Street Market Rockford, Fall 2018. 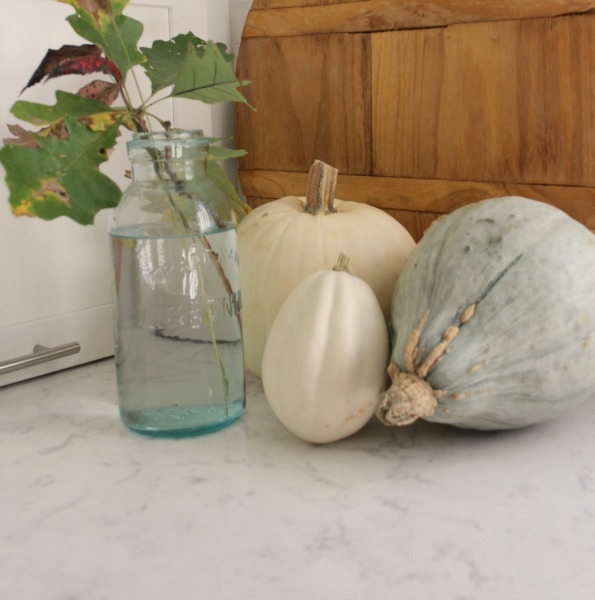 The color of this pale blue grey gourd is so perfect, and I love how my blog pal paints her pumpkins to her liking. Hello Lovely Studio. My Fall Kitchen, 2018 and Main Street Market Rockford, Fall 2018. A round farmhouse style table similar to ours is right here. A wee breakfast area in the kitchen. Hello Lovely Studio. My Fall Kitchen, 2018 and Main Street Market Rockford, Fall 2018. 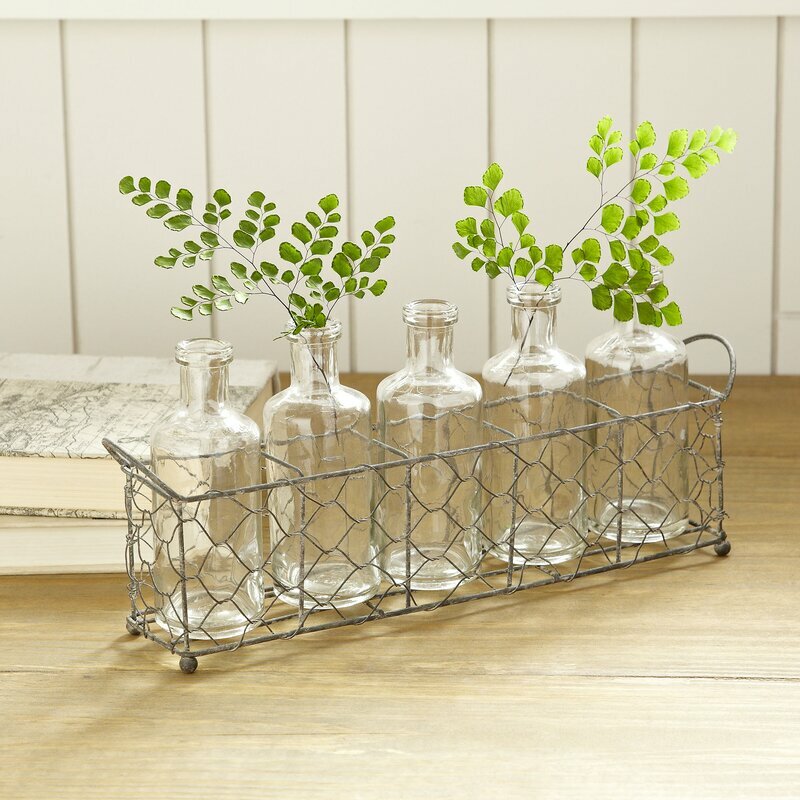 I usually reach for great big simple glass vases, but wouldn’t these be adorable with a little branch in each? 6 piece vase set: FIND HERE. A beautiful non-old plate: FIND HERE. I picked up my Magnolia Home (Joanna Gaines) candle at the famed Magnolia Market in Waco (read about my trip HERE), but you can score your own candle with the click of a mouse RIGHT HERE. 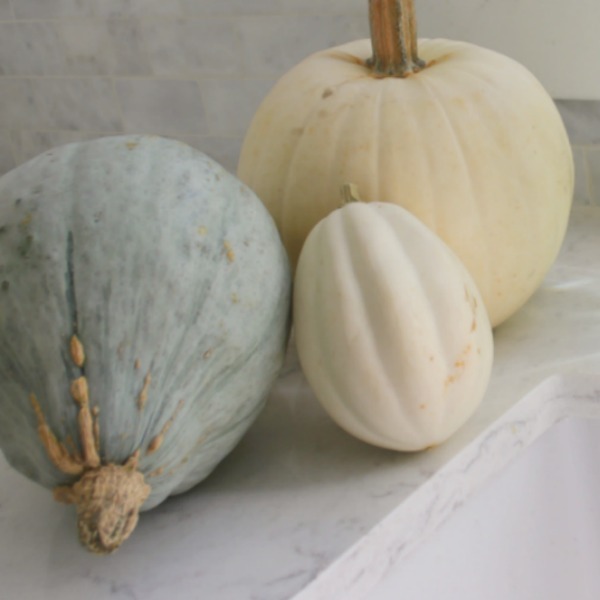 DIY easy and cheap pumpkins. Hello Lovely Studio. My Fall Kitchen, 2018 and Main Street Market Rockford, Fall 2018. 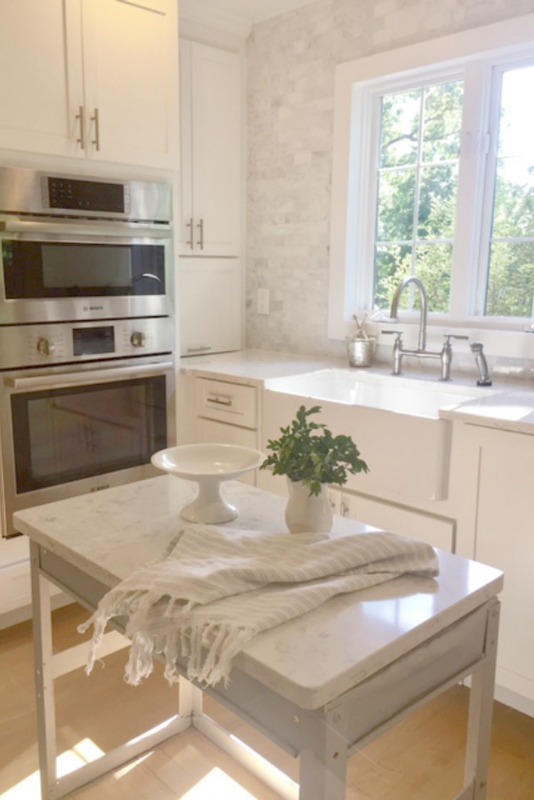 Our kitchen countertops are Viatera quartz in a color called MINUET…one of my most popular posts EVER is the one where I walk you through how to choose the perfect color of white quartz for your kitchen. 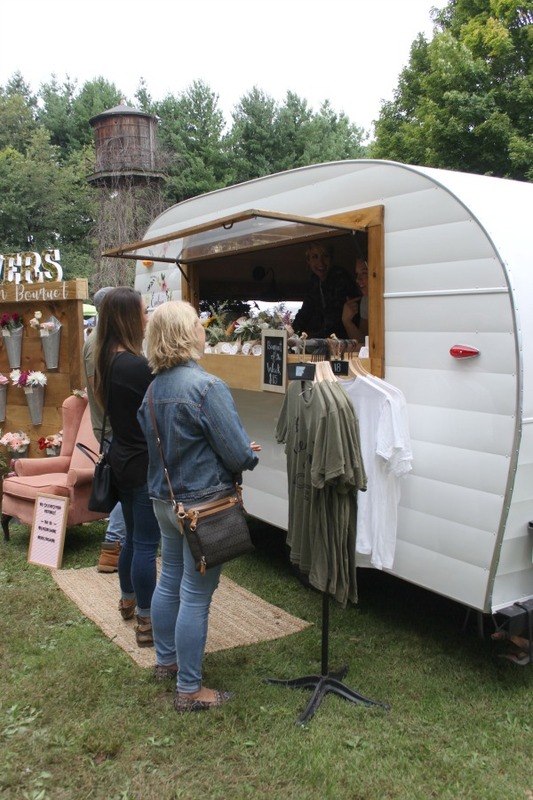 Every fall and spring in Rockford, IL, swarms of farmhouse style fans gather from around the country for a fabulous open market specializing in country farmhouse finds – with vintage, handmade, and new in the mix. 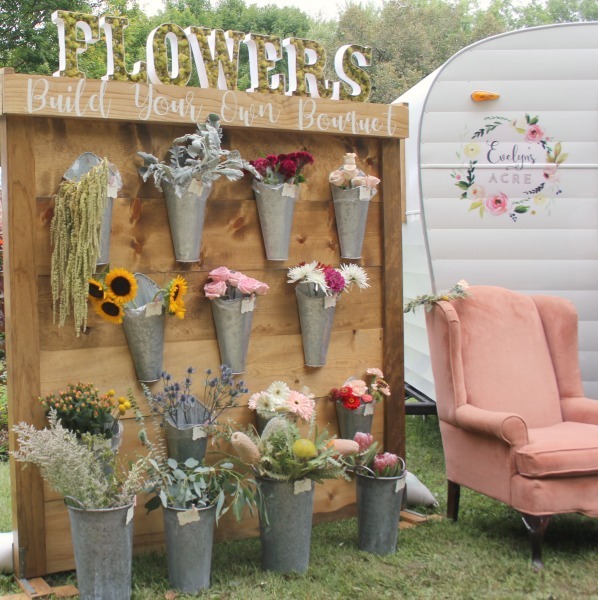 The sale features 150 wonderful vendors and is the brainchild of Urban Farmgirl. Such a peacefully sweet way to shop. Main Street Market Rockford, Fall 2018. Urban Farmgirl hosts this open air sale twice a year at Midway Village Museum in Rockford, IL. It’s an exceptionally wonderful group of vendors, musicians. and good food, and no one goes away empty handed! This video is so worth your time and truly captures the market’s spirit. You’ll even spot some weathered green shutters that I ended up buying later in the day! Ha! 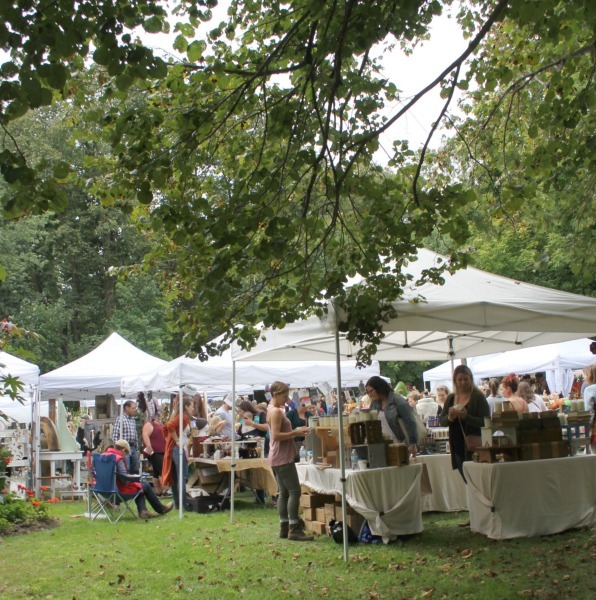 You’ll also be introduced to my favorite vendor at this fall’s market: Evelyn’s Acre (keep reading to see why!). I always attend this market, and even with the crowds, I fortuitously bump into the Urban Farmgirl herself and sneak in little interviews. This year, she told me I need to check out Urban Farmgirl’s new local warehouse (well new to me anyway) so I intend to! If ever you find yourself near Rockford, make sure to pop into her shop: 2202 Rural Street. Oh, guys. 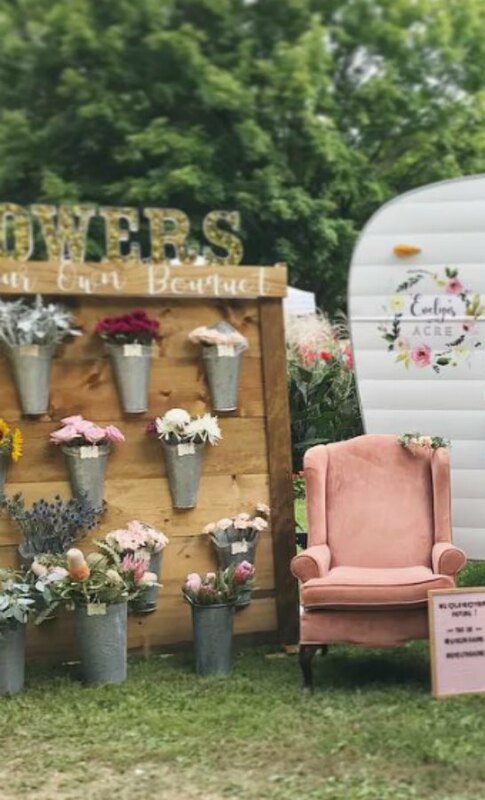 This young couple and their camper blooming with smiles and fresh bouquet ingredients was beyond adorable. 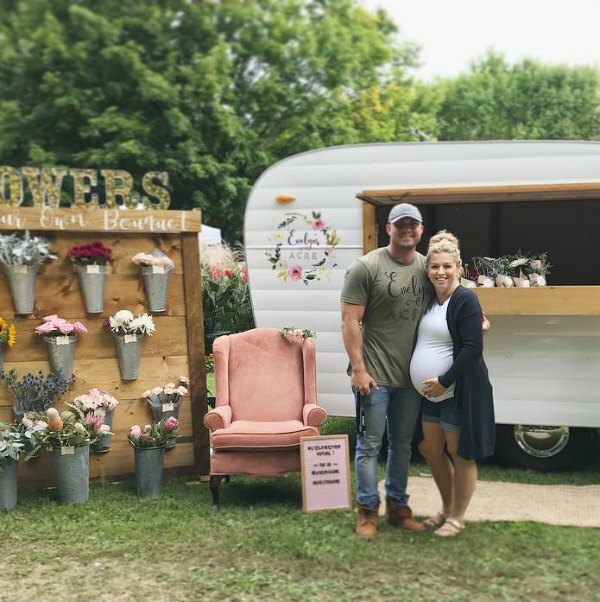 The baby was due the day of the market! Darling owners of Evelyn’s Acre at Main Street Market Rockford, Fall 2018. Thanks for taking time to talk to me and for your gracious, life-giving, lovely spirits. You’re bringing smiles to the earth. Urban Farmgirl hosts this open air sale twice a year at Midway Village Museum in Rockford, IL. It’s an exceptionally wonderful group of vendors, musicians. and good food, and no one goes away empty handed! They travel all over locally with this concept of building your own bouquet – it’s a simple yet widely popular invitation. They grow some of the flowers, and I asked if they had big dreams to be farmers and grow lots more blooms…why, YES, yes they do! Lately I have found myself interviewing a variety of sellers of fresh flowers, and they are all extremely happy people…coincidence? A charming display. Main Street Market Rockford, Fall 2018. 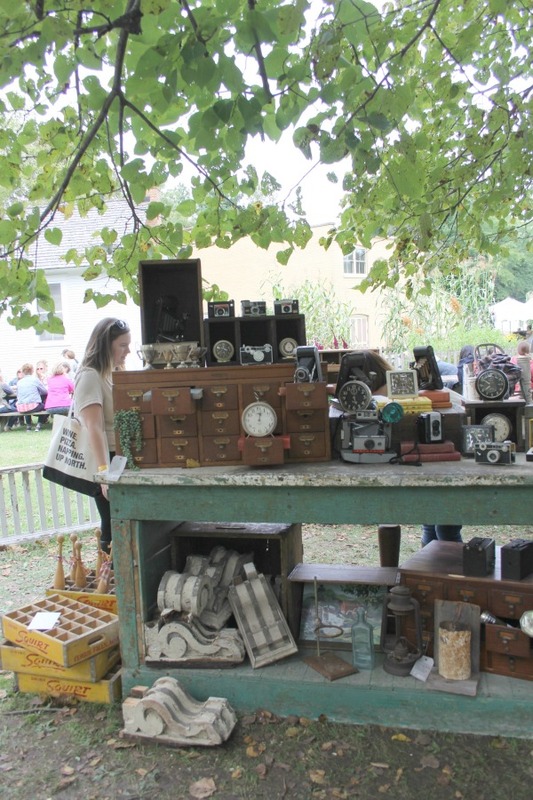 Urban Farmgirl hosts this open air sale twice a year at Midway Village Museum in Rockford, IL. It’s an exceptionally wonderful group of vendors, musicians. and purveyors of yum, and no one goes away empty handed! 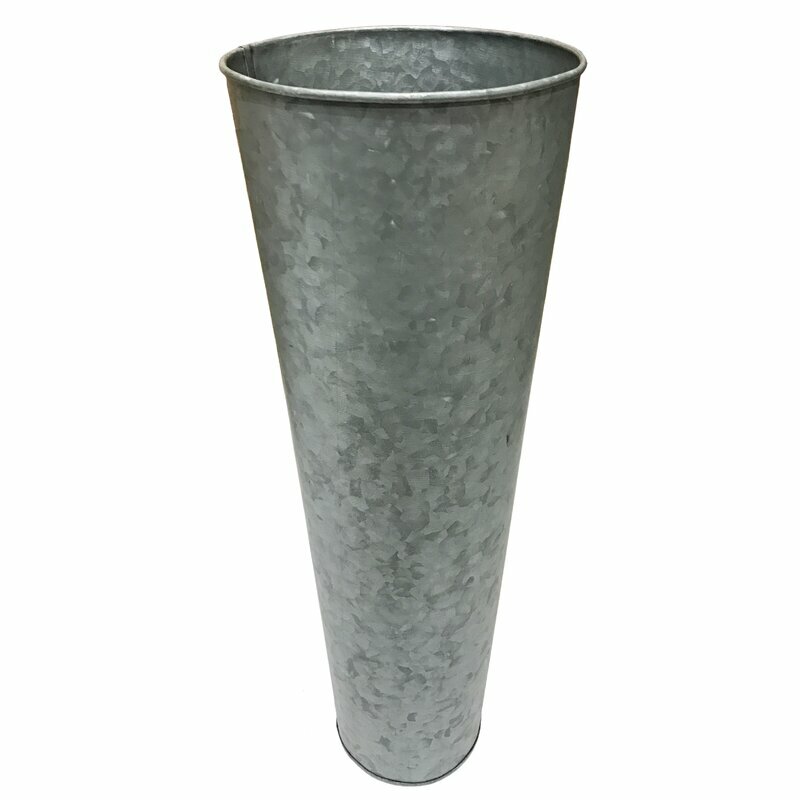 French Metal Flower Bucket: FIND HERE. 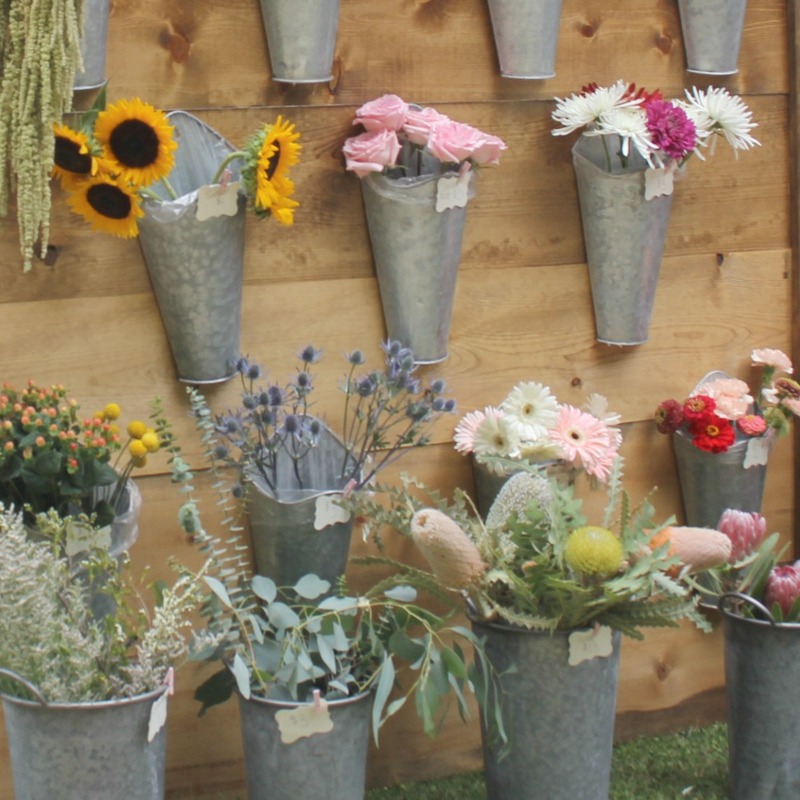 Find your own galvanized farmhouse style vases HERE. 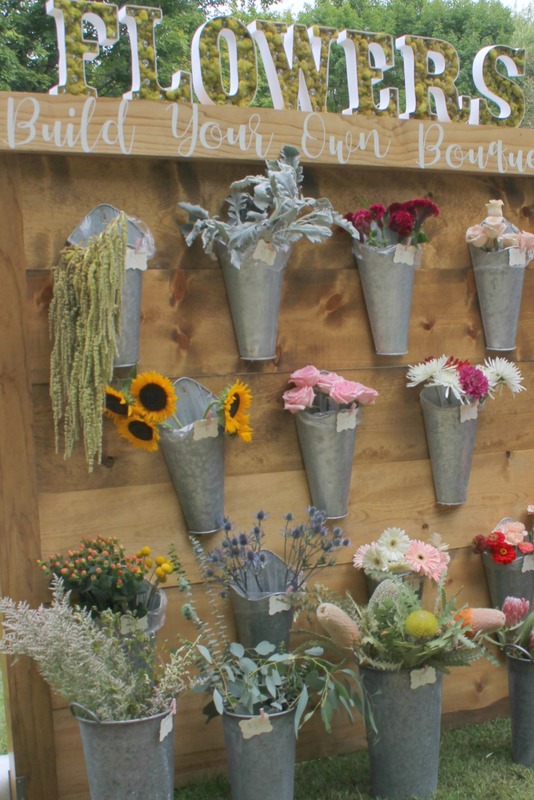 Build Your Own Bouquet. Main Street Market Rockford, Fall 2018. Urban Farmgirl hosts this open air sale twice a year at Midway Village Museum in Rockford, IL. It’s an exceptionally wonderful group of vendors, musicians. and good food, and no one goes away empty handed! Hard to resist!Main Street Market Rockford, Fall 2018. 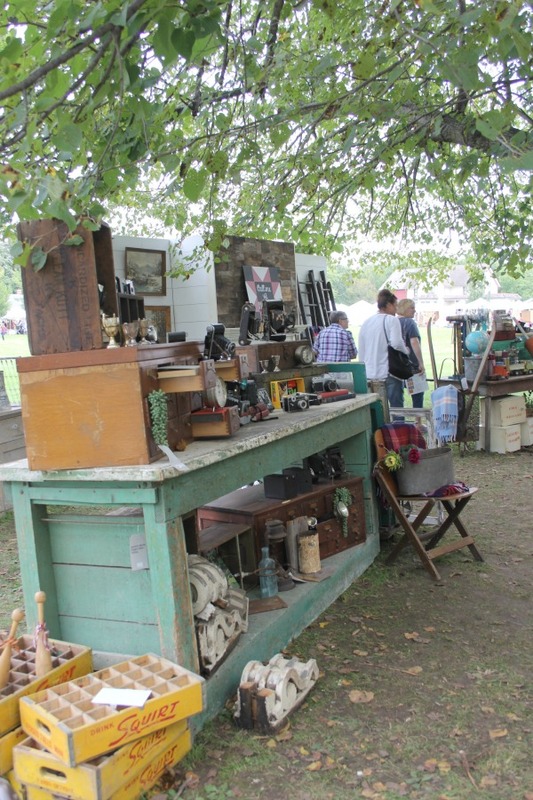 Urban Farmgirl hosts this open air sale twice a year at Midway Village Museum in Rockford, IL. It’s an exceptionally wonderful group of vendors, musicians. and good food, and no one goes away empty handed! 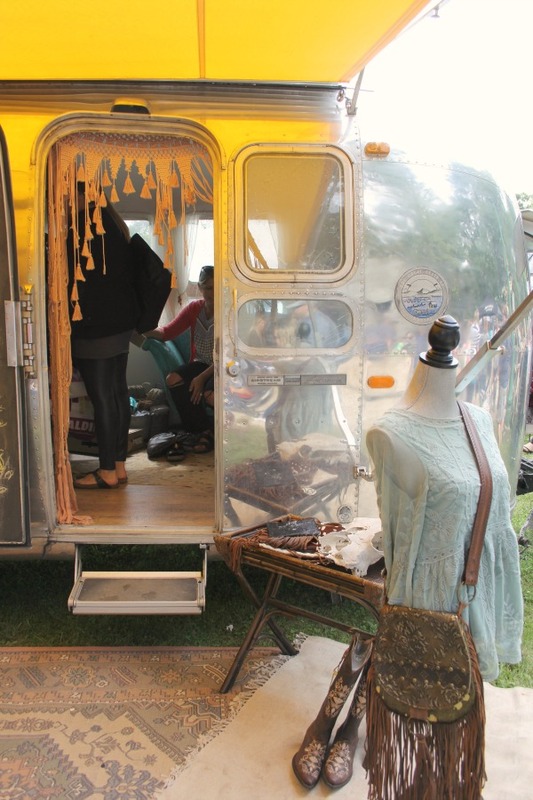 Should you have an extra vintage camper lying around that you wish to donate to this blog, hook a sister up…can’t you see Hello Lovely on the side of one? Evelyn’s Acre at Main Street Market Rockford, Fall 2018. Also, wouldn’t this be an incredible idea for a wonderful party, bridesmaid luncheon, or fundraiser? Main Street Market Rockford, Fall 2018. Urban Farmgirl hosts this open air sale twice a year at Midway Village Museum in Rockford, IL. It’s an exceptionally wonderful group of vendors, musicians. and good food and no one goes away empty handed! 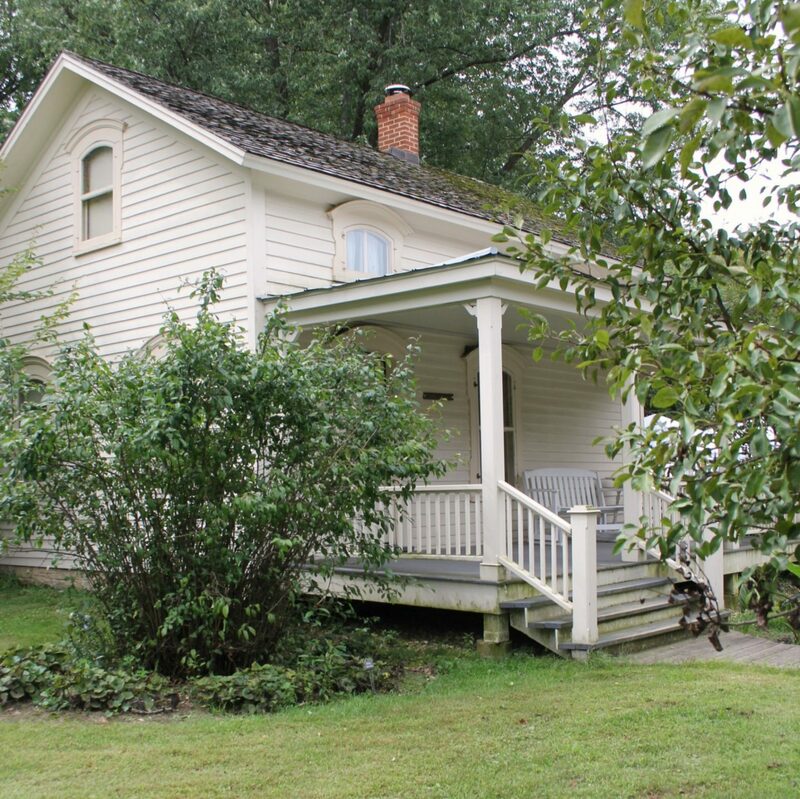 A sweet ol’ farmhouse crush. Main Street Market Rockford, Fall 2018. 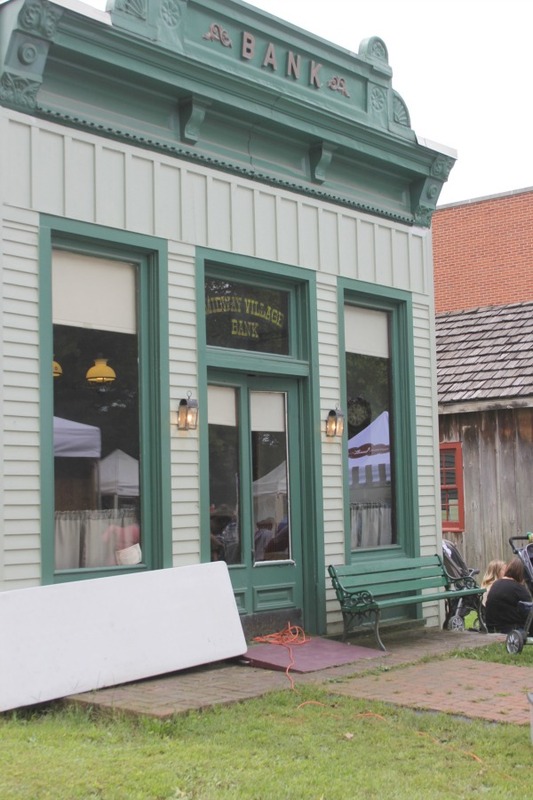 Urban Farmgirl hosts this open air sale twice a year at Midway Village Museum in Rockford, IL. It’s an exceptionally wonderful group of vendors, musicians. and purveyors of yummy food, and no one goes away empty handed! Main Street Market Rockford, Fall 2018. Urban Farmgirl hosts this open air sale twice a year at Midway Village Museum in Rockford, IL. It’s an exceptionally wonderful group of vendors, musicians. and purveyors of yummy food, and no one goes away empty handed! 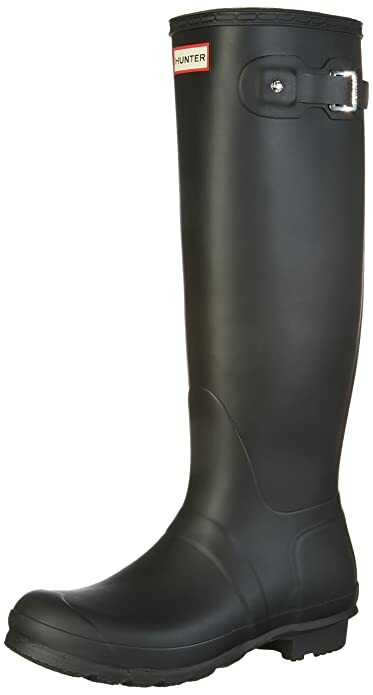 Heading to the Fleamarket – Maybe You Need These! 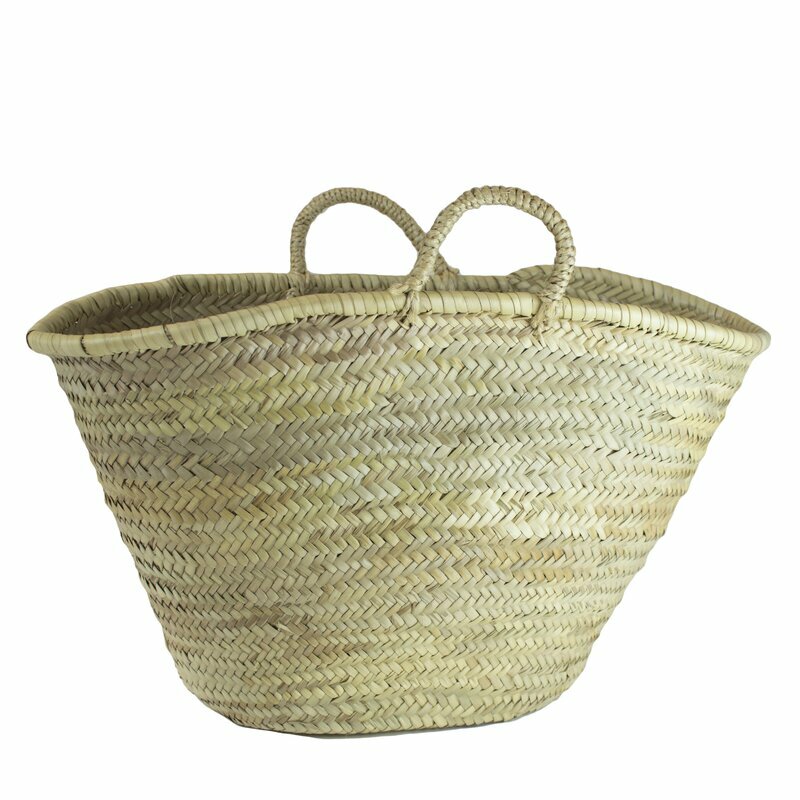 French Market Wicker Basket: FIND HERE. 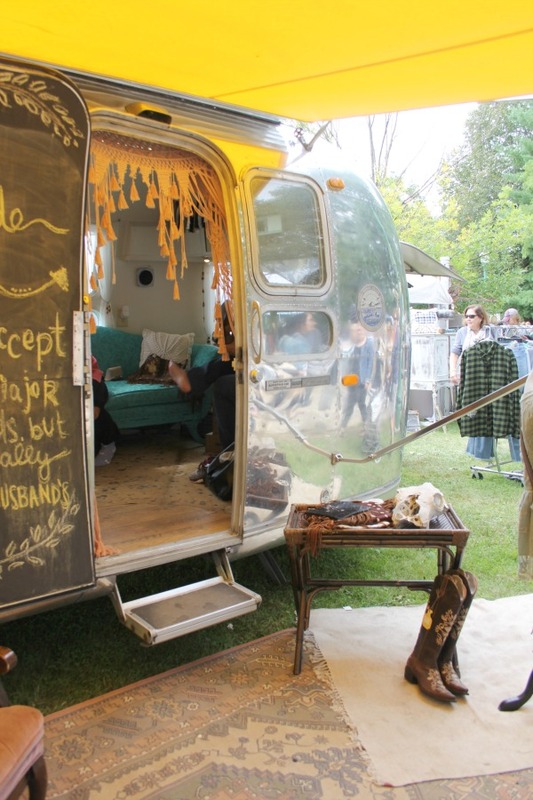 Airstream loveliness. Main Street Market Rockford, Fall 2018. 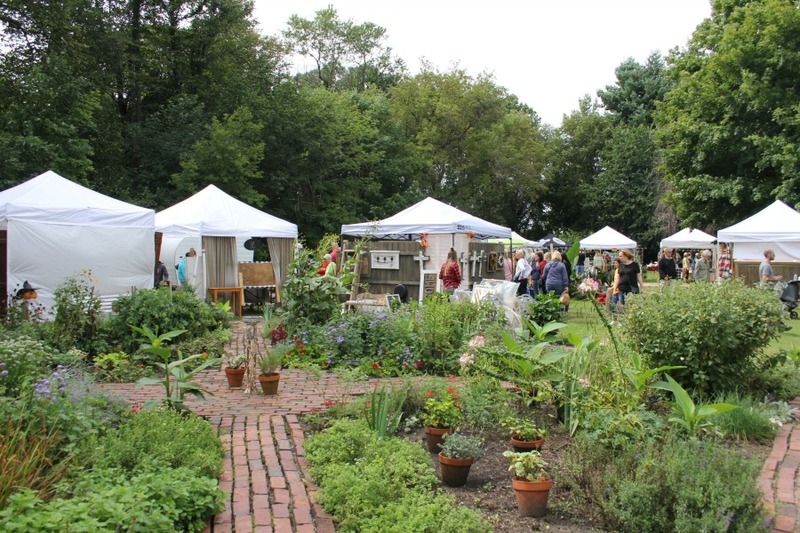 Urban Farmgirl hosts this open air sale twice a year at Midway Village Museum in Rockford, IL. It’s an exceptionally wonderful group of vendors, musicians. and purveyors of yummy food, and no one goes away empty handed! The live music was incredible this time around, and the food smelled amazing (can’t wait to be able to eat normally again!). Next Post Paint Colors in Timeless Blue and White Kitchen! I love your kitchen, so bright and welcoming. 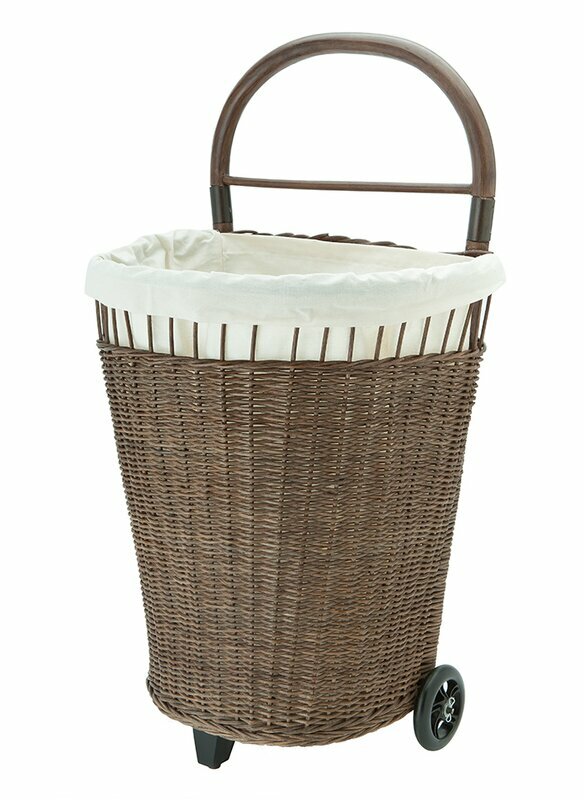 And with that adorable rescued cart. The market looks like a blast! Sure. I bought them – several different styles (some are distressed canvas and others are Belgian linen) from Restoration Hardware. You can likely still find Belgian linen pillows from them, but the printed vintage looking ones are difficult to find and sometimes show up on ebay here: http://fxo.co/6F7j. Hope this helps. I should also mention I bought them about 10 years ago. 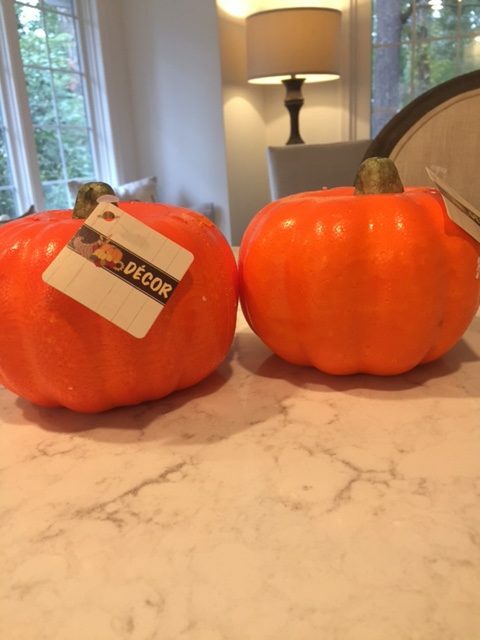 I too painted one of those bright orange Dollar Tree pumpkins. I do light naturals in my home too. I painted it with various craft and other latex paints to look similar to a Jaradale pumpkin (blue-ish green in color)….all paint I had on hand. It took several light coats of paint layered on to look just right. The extra light coats of paint also eliminated the little ‘holes’ and the seam of the styrofoam. 😉 I took off the ‘stem’ and inserted a dried & broken small, squat branch from a bush in our yard. It looks uncannily real! So much fun with dollar items and no need to purchase real ones (that don’t last as long). You’re amazing! Thank you for your help with painting these foam pumpkins -I didn’t even see the silly holes until I posted the images! ha! I definitely have more painting in my future, and I love the idea of a fresh branch for the stem – in fact I collected a bunch of stems which had fallen off the gourds at the local market so I do have a supply. 🙂 Are you ready for your column as a DIYer/creative dynamo on this blog? Because I am often too lazy to capture the steps and create tutorials! Happy fall, friend. I would love DIYs that are tasteful. Bring them on! Your roses dipped in plaster are like little pottery pieces. I have some faux roses ( not sure why I bought them) that I going to snip, dip and display! I decorate very simply for fall. I have two cream coloured glass pumpkins of different size that I put out. That is it! I like to use rose hips and branches in vases or pitchers, along with a few baby boos in a dish. 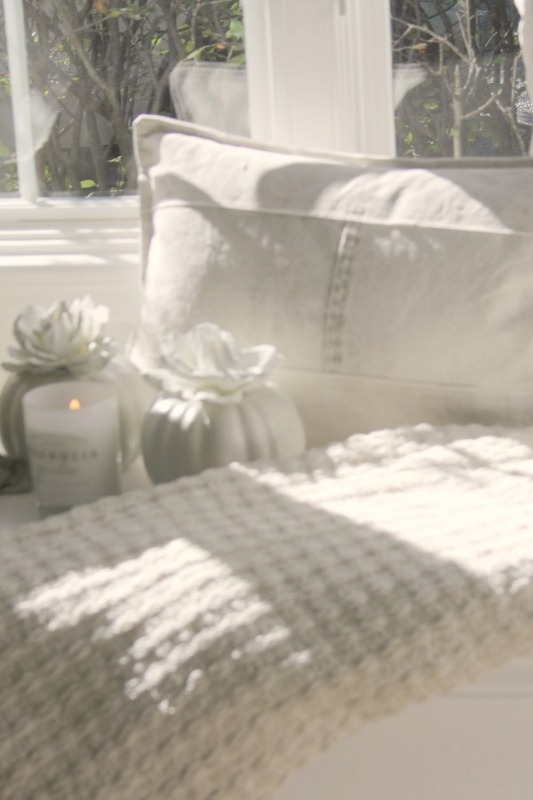 Autumn is more a time for cozy throws, candlelight and a lit fire. 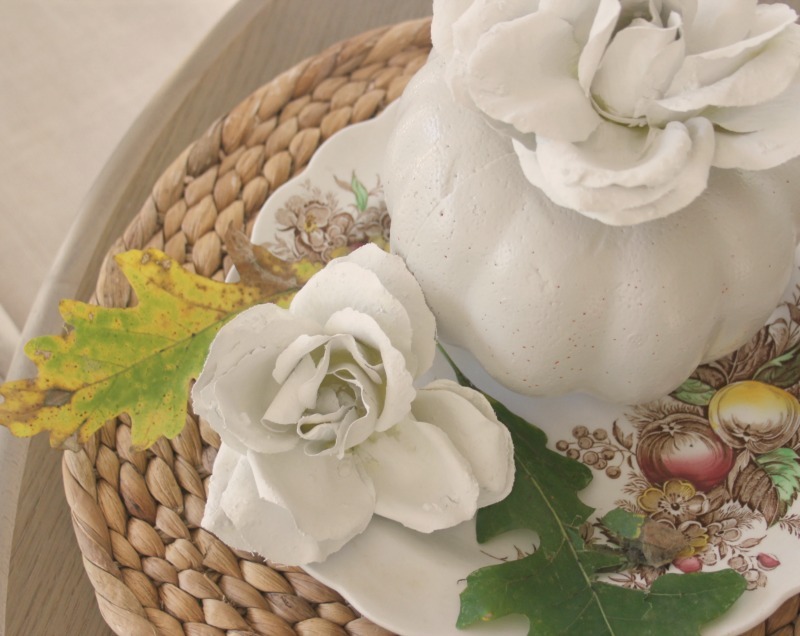 Hi Michele, I love your fall decorating tips for bringing the outdoors in! So calm and peaceful. And the Market looks amazing!!! Rockford looks like such a charming place. Wishing you happy hunting! Thanks, Holly. Happy almost weekend, friend. The whole post is swoonworthy, but I have to say those Dollar Tree pumpkin makeovers are the best I have ever seen. I am certainly inspired to try this idea! I literally thought they were porcelain or ceramic! That market looks so amazing! Thank you for sharing all this eye candy at TFT! Thank you, Amber! You’re so sweet to me. I need to do more DIY for the blog. I get very shy since so many others are better at the crafty stuff. Thanks for hosting TFT, friend. This is so beautiful! Thanks for sharing with Thursday Favorite Things – I’ll be featuring you tomorrow! Yahoo! Thank you so much, Angelina – I’m honored and love your link parties and getting acquainted with other bloggers! Good morning! 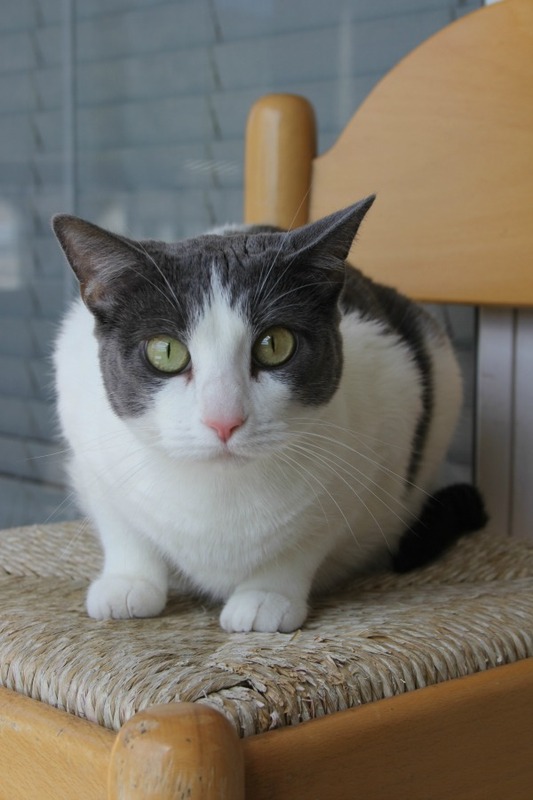 I am back to let you know I am featuring you today at Thursday Favorite Things! Thanks for sharing with us! Thank you so much, Amber! I just visited the post and got lost in a bunch of fall lovely – thanks for letting me know!